Erth Minerals Posey Blusher is an all-natural blush that is a fabulous pink color with gold shimmery undertones! 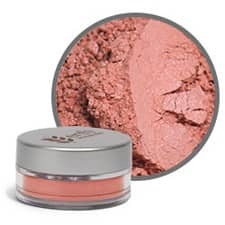 Posey Blusher makes cheeks look sunlit and glowing! 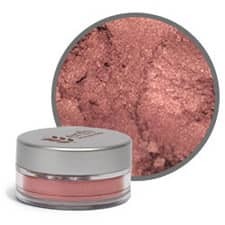 Great to give you blushing golden glow during the day, or for added cheekbone emphasis at night. Adds color and sparkle to all shades of skin. This wonderful mineral makeup blusher also makes a great all-over-face color. The correct blusher color and application technique can make any cheekbone really stand out. The easiest way to choose the perfect blush color is to pinch your cheeks and then match a blusher shade to your cheeks. Choose a blusher that matches pinched cheeks exactly, or one that is not more than one to two shades darker. Generally speaking, for ivory or light beige skin tones and daytime where, blushes with soft pink undertones (Petal or Primrose) are usually your best choice. For warmer skin tones, consider Peaches. For nighttime wear, consider a deeper tone with more shimmer (Posey or Aster) Never use a bronze or brown-toned shade. For tanned skin tones, consider Petal or Primrose for daily wear, or Posey and Aster for nighttime wear. If you have an olive skin tone, choose a blusher with warm undertones (Peaches or Posey) or a Plum shade. For Middle Eastern women and if your skin has a somewhat greenish tone, choose a deep bronzer, or a blusher with Plum, currant (Zinnia), or deep rose shades (Guava or Posey). Ebony or bronze skin tone? Try Plum for daytime and Guava or Zinnia for a more dramatic nighttime look. Or consider a bronzer rather than a blusher. 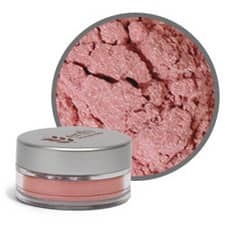 The best brush for applying mineral blusher is a large, fluffy brush like Erth Minerals highlighting brush. Its wide area gives a more natural, smooth blusher look. It is usually a good idea to have a couple blusher colors on hand- one for day and one for night. Mineral blushers can be applied lightly, all over the face, to give a general glow, just to cheek bones and apples, or to areas normally hit by the sun- the tip of nose, forehead, chin, and cheeks. The order arrived very quickly. The product was as I thought it would be. Color description was good. Its a lovely warm shade of peach that would look great on almost any fair-medium complexion. Definitely gives you a glow! but not in a shiny way. highly recommend! Lovely dark pink color. I use the neutral foundation shade...think its 2.3. The semi-sparkly part is true, but its very slight bc you don't have to use alot to get color. Pinks tend to not show up on me. I had to go this dark for it to look like a nice rosy flush. I've tried Bloom, while a beautiful color, it disappeared on my skin. Love this one though!